News that Google is to get into the ride-hailing scene — the same taxis-that-aren’t-taxis business pioneered by Uber — may have come as a surprise to some. We can speculate that it may even have come as a surprise to some at Uber that Google is to become a competitor, considering Google’s chief legal officer David Drummond sits on Uber’s board, and Google has invested hundreds of millions in the start-up. What’s interesting is how determined Google is to take its research in autonomous, driverless cars and put it to use in the taxi business, in doing so possibly driving an autonomous cart through the traditional transportation services market. It’s well known that innovation is about combining existing technologies into products and services that offer new value for customers. Often this innovation arrives incrementally, refining existing concepts to better satisfy a known market. The combination of autonomous cars and Google’s extensive cloud services in the context of the taxi business promises to be much more radical. Admittedly it will be a bumpy road, with numerous regulatory and political hurdles to cross. Uber has already come across such issues as it has expanded to some 250 cities across the world. However, as both the technology and the market is there, it’s not so hard to imagine that this could produce fairly radical innovation. It’s mainly the question of when that’s difficult to predict. So the technology is there: as economists Eric Brynjolfsson and Andrew McAfee pointed out in their recent book The Second Machine Age, computers are increasingly capable of doing things that in only the fairly recent past were either laborious or impossible. Pattern recognition and complex communication are areas where the unthinkable is increasingly becoming thinkable. 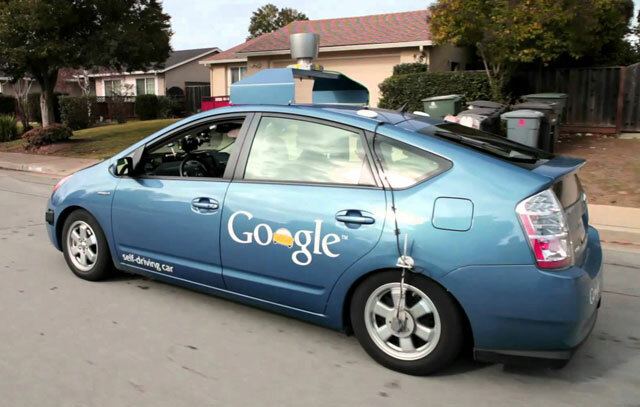 Using sensor and communication technologies combined with information processing power, Google has led the way in showing how self-driving vehicles are more than science fiction. The fact that all major automakers are making significant investments to keep pace show that this is for real. And the market is there too: once we stop thinking about autonomous driving as an add-on feature that will incrementally improve cars, a huge market opens up. So far manufacturers treat autonomous driving tech such as parking assist, pedestrian detection, auto-braking systems and vehicle-to-vehicle communication as premium features for those willing to pay. But seen through Google’s eyes, their impact could be much more dramatic: Google CEO Larry Page has suggested the firm’s investment in self-driving technology is about reshaping the city to be safer, cleaner and more efficient. For this to come to fruition will involve many organisations and groups, and would be likely to reshape the auto market too. The willingness with which customers have adopted Uber is an indication what may lie down the road. As always, we cannot tell exactly how it will play out. But history tells us that when sufficient technology and a ready market go hand in hand, established structures and companies will have a fight on their hands. Consider, for example, the painful struggle of the music industry as digitisation and broadband Internet transformed its prospects, putting new players in charge. While recourse to regulation and law put a brake on change for a while, even though some pioneers such as Napster fell by the wayside, many more rose to take its place. Perhaps this is what Google has in mind: betting on transforming transportation itself, rather than changing how aspects of the business are conducted. Creating a successful autonomous taxi service would stimulate investments into all manner of new areas of transportation, promising huge productivity gains. Leading that development is a role that would see Google stepping well beyond its origins in search engine advertising.